Coast of La Jolla - TourGuideTim Reveals San Diego! Highlights for the La Jolla Coast: The coastline next to the Village of La Jolla is one of the most picturesque settings in the country. 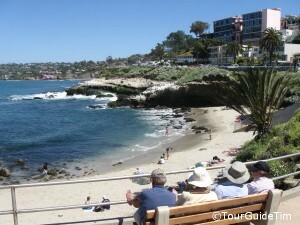 When you see beautiful pictures of La Jolla, this is the area where they were taken. Unlike most of the San Diego coastline where visitors frolic on the beach, most visitors to La Jolla are here to soak in the views while going for a walk or enjoying a picnic. Afterwards, visitors will walk two blocks up the hill to stroll along Prospect Street and Girard Avenue in the Village of La Jolla. Here they can browse through shops and art galleries and enjoy a nice meal. For those who want more beach related activities, you will want to visit La Jolla Shores, which is a little over two miles away. Ellen Browning Scripps Park – This 5.2 acre park is one of the most beautiful settings in the world. The grassy knoll is lined with palm trees and sits several feet above the Pacific Ocean. Looking north you will see swimmers navigating the ocean currents on their 1.5 mile route through the La Jolla Underwater Park Ecological Reserve, past La Jolla Shores beach and towards the towering cliffs of Torrey Pines. Looking east you will see the Village of La Jolla just two blocks up the street and the hillside homes on Mount Soledad. Looking towards the Pacific Ocean, you get to watch the waves crash below your feet. Bring a picnic and enjoy life. On Sunday afternoons from June through August, you can also enjoy a free concert at the park. Ocean Swimming – The La Jolla Cove Swim Club has put together a great page of advice for those who want to swim in the area between La Jolla Cove and La Jolla Shores. It includes a list of times throughout the day when you can join others who will be swimming. Everyone is welcome. You will also find information on swim safety, what sea life to look for during your journey, and information about competitive events. The one-way distance from La Jolla Cove to the La Jolla Shores boat ramp used by kayakers is 2/3rds of a mile while the one-way distance from La Jolla Cove to Scripps Pier is 1.7 miles. The most recognized ocean swimming competition is the La Jolla Rough Water Swim. Started in 1916, the event takes place in late September. Over 2,000 participants swim either a 1-mile or 3-mile course. Scuba Diving – Divebums.com provides detailed descriptions for local dive spots. The area between the Village of La Jolla and La Jolla Shores is the most popular location for scuba diving in San Diego. The biggest attraction for diving in La Jolla is the San Diego-La Jolla Underwater Park Ecological Reserve, a 533 acre underwater marine preserve. Visit our diving page for more information on scuba diving in San Diego and learn more about La Jolla Shores, where most dive tours begin. Seals at Children’s Pool – Children’s Pool is a very small beach just past the south end of Ellen Browning Scripps Park. A seawall was originally built to stop the waves in this small area and provide a safe place for children to play in the ocean. Seals found their way into this quiet cove and now dominate the landscape. On any given day, you will see dozens of seals bathing on the beach or flopping around in the water. This has led to a tug-of-war between those who want the seals to be left alone and others who want the seals moved away so that children can enjoy the beach. Sometimes you will see a rope and signs protecting the seals and other times you will not. It depends on the latest court decision. For now, the seals remain. Your best bet is to walk out on the sea wall to get the best view. The sea wall can be slippery but it does have railings. The sea wall is a nice place to not only view the seals but to watch the waves crash against the opposite side of the wall, right below your feet. Sunny Jim Cave – You can explore one of the caves in La Jolla Cove by visiting the Cave Store at 1325 Cave Street. (It is just a block uphill from La Jolla Cove Beach.) There, you will pay a nominal fee to descend down a tunnel with 144 steps to the Sunny Jim Cave. You will be in the back-end of the cave while looking out the opposite side to the Pacific Ocean. It is fairly dark making it somewhat hard to see. The Cave Store does not have its own web site but you can learn more by looking at the San Diego Bike and Kayak Tours web site, which offers tours into the Sunny Jim Cave as part of a larger tour of the La Jolla Cove. Coast Walk – If walking along Ellen Browning Scripps Park, Coast Boulevard, and around the Village of La Jolla is not enough for you, consider the Coast Walk. Half-way up the hill on Coast Boulevard just before it reaches Prospect Street (right outside the Sunny Jim Cave), you will see a hiking trail if you look north. The Coast Walk is also labeled on Google Maps. (See Google Map directions below.) 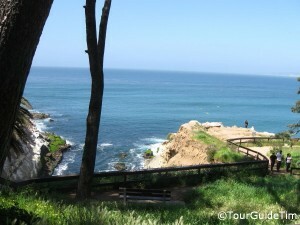 This trail takes you above the caves in La Jolla Cove and behind multi-million dollar homes. Proceed with extreme caution because you will be walking along the top of the cliffs. The round-trip to enjoy this beautiful oasis is two-thirds of a mile. Lifeguards are on duty year-round. Generally, you will see them from 9AM – Dusk. No alcohol is allowed on the beach or in the parks. All beaches and most parks throughout San Diego County are smoke-free. A few do provide designated smoking areas. Parking – Street parking is free but there is typically a 2 hour limit. You will find street parking all along the ocean side of Coast Boulevard. The farther south you go, the better chance you will have for finding an open parking spot. When you pass Scripps Park, make a right turn to continue on Coast Boulevard. It will eventually meet back up with Prospect Street, where you can make a left and look for parking in the Village if you did not find a parking spot along the coast. La Jolla Sightseeing Tour – TourGuideTim, owner of this travel web site, offers half-Day, Expert-Guided Tours from San Diego to La Jolla and Torrey Pines. Enjoy Amazing views, Fascinating Trivia, and free time. See 360 degree views from one of the highest hilltops along the Southern California coast, Multi-million dollar mansions, Sea Lions, Seals, Brown Pelicans, Cormorants, Paragliders flying off ocean cliffs, and Torrey Pines Golf Course, home to the 2008 U.S. Open. Learn about History of Aviation, Geology, Architecture, Famous Residents, and more. Get more sightseeing tour details, check out the reviews from past guests, and book your tour today! 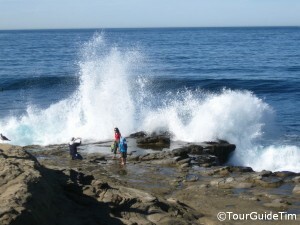 La Jolla Travel Blog – Get to know La Jolla intimately through the eyes of Elizabeth Hansen. Elizabeth is a professional travel writer who has written for the likes of Frommer’s and National Geographic Traveler. She provides unique insight, in a well-written style, about her hometown. 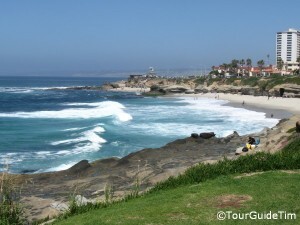 Her blog about La Jolla is a fun way to learn about the area for both locals and visitors. Picture Slideshows of La Jolla!